For a small, four-square-mile island, Chambers Island’s list of nesting and migratory birds includes a remarkable number of species deemed as rare, endangered, special concern or of greatest conservation need. For the birds, Chambers Island provides a safe resting stop on their migration or a summer nesting site to raise their young. Earlier this spring, forester and Chambers Island summer resident, Tim Fitzgerald, spent the morning in the woods with a feathered friend who followed him contently. Tim’s photo officially marks the 170th bird species recorded on Chambers Island. 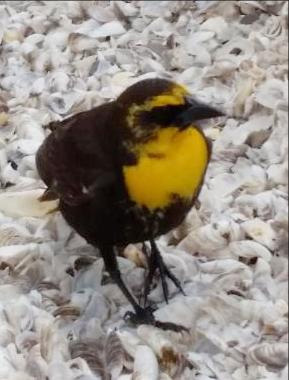 While the Yellow-headed blackbird is fairly common on the island, sightings like these are daily reminders of the incredible creatures and plants sustained by our land protection work–and of the reasons we must continue protecting Door County’s open spaces and wild places.